Blonde wigs can be glamorous and with double choice. 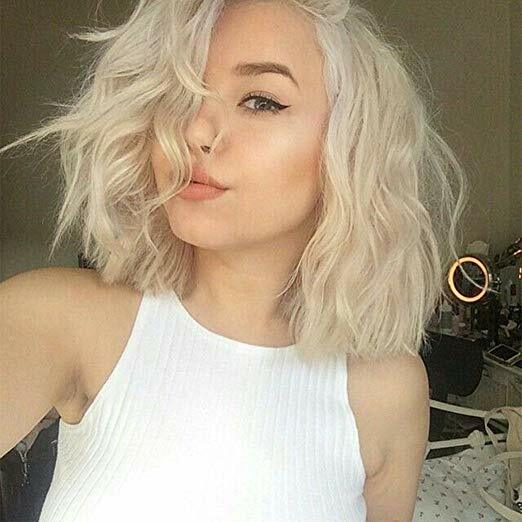 You can wear blonde color for a short time period. If you don’t like the color then you can dye it into other colors like black or red. Unlike black color wigs, it’s easier to dye blonde wigs. 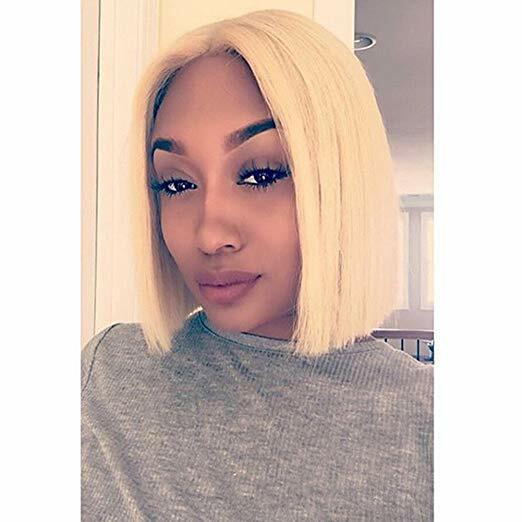 Since it’s summer now, short blonde wigs are better for the hot weather! 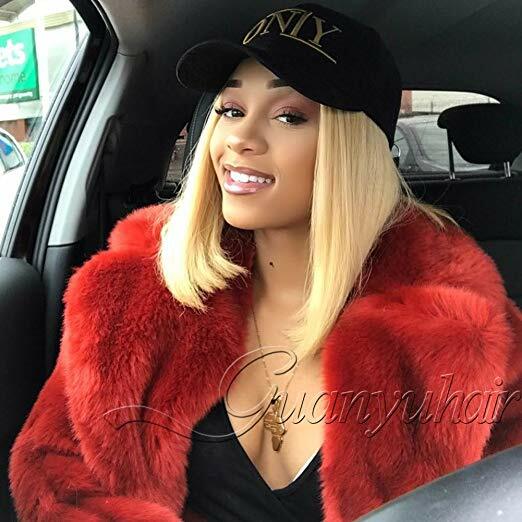 Here are Top 10 Best Short Blonde Wigs of 2018 with detailed Reviews. 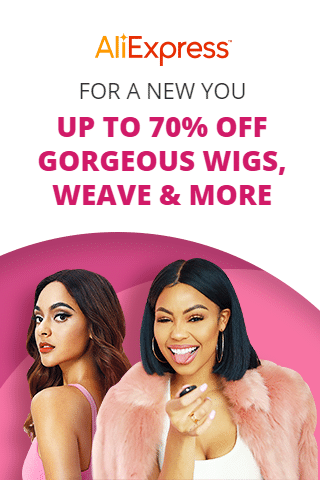 Wigs in the below list are all human hair wigs. This wig’s hair color #613 and hairstyle 12inch bob are all inspired by pop singer Nicki Minaj. 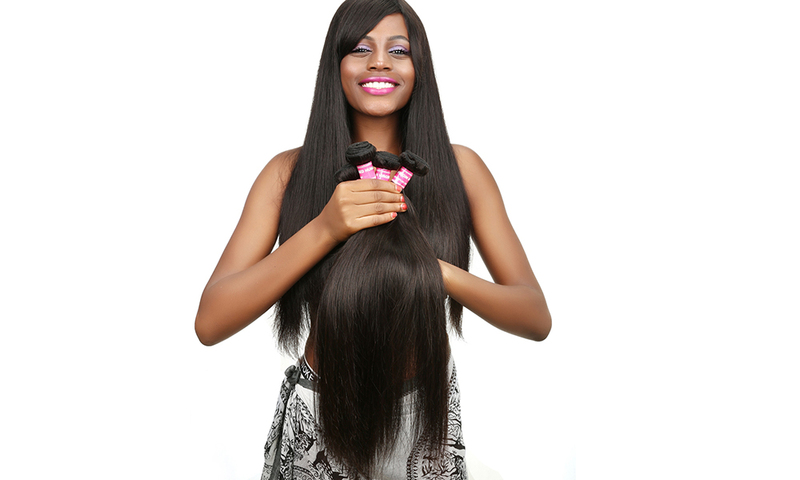 The wig is made of 100% Brazilian virgin human hair and labeled with No lice, No smell; shedding free, tangle free. The cap lace color is medium brown while the hair density is 130%. The hairstyle is free and you can restyle it into various hairstyles you like. You can dye, you can cut, you can iron it. 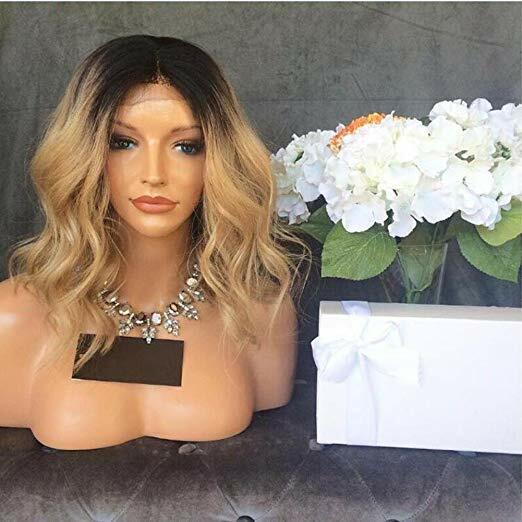 The wig is fulfilled by Amazon which means you can return it easier if you’re not satisfied with the wig you received. Another celebrity hairstyle inspired bob wig! This wig is made of 100% Peruvian virgin human hair. Its lace net is with clips, tiny combs and flexible bands which makes it very easy to adjust the wig cap size. 130% hair density. The wig accepts custom orders. They provide different cap sizes (middle, small & large) and different lace colors (medium brown, dark brown, light brown & transparent). With baby hair and pre plucked hairline, it can bring you a very natural hair look! What’s more, there’re different lengths available for this style wig, from 8in to 16inch. 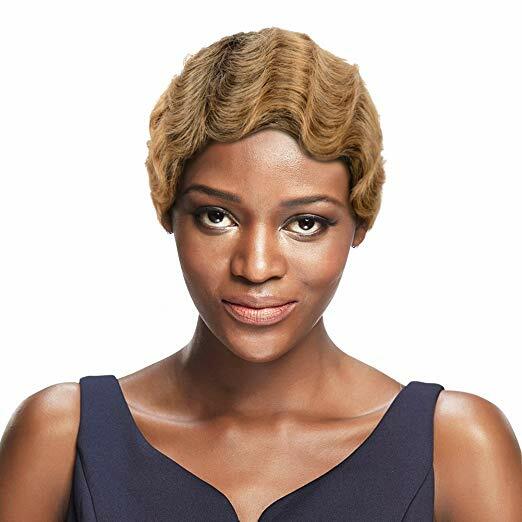 Look & feel like YOUR OWN HAIR with this 100% soft human hair RETRO FINGER WAVE WIG. Neat rows of “S” shape curved undulations give an elegant touch of sophistication. Finger waves worn closed to your head for the classic look of the flapper era, showcasing your delicate features. 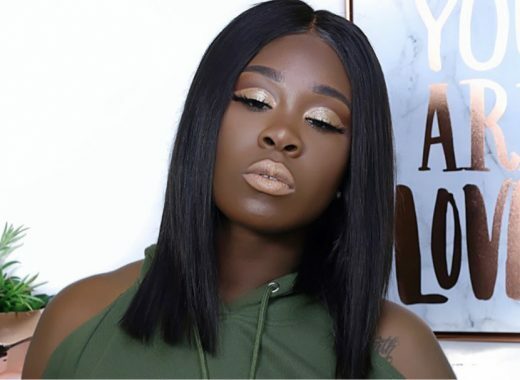 This wig is suitable for dark skin tone, effortless for you to create a retro style. It’s also great for daily wear, parties & fashion show. 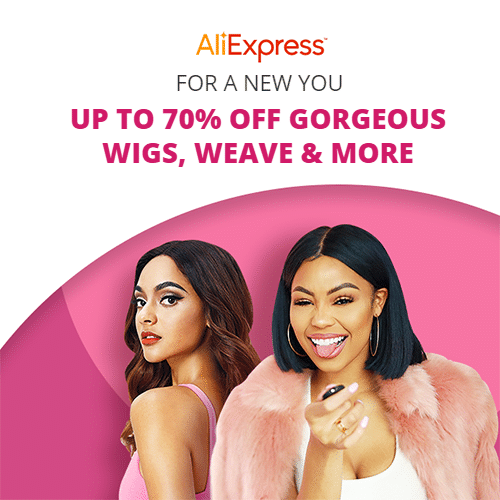 SLEEK is a new wig brand from the biggest Chinese hair wig company – Ruibeika. 130% hair density. Only free part with baby hair. Dark roots. Medium brown lace cap. Medium size cap. Yeah, the seller KRN only provides so few information. 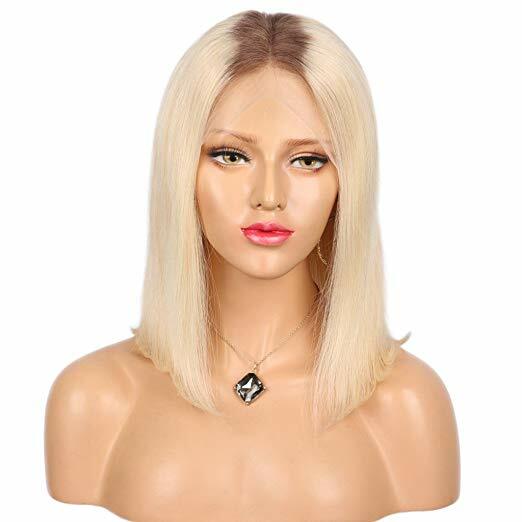 KRN sells lots of human hair wigs on Amazon and most of their wigs sell well and with many positive customer reviews. Maybe this wig is not their STAR product so they didn’t highlight it! Whatever, the wig is wonderful! This wig is made of Brazilian remy human hair. 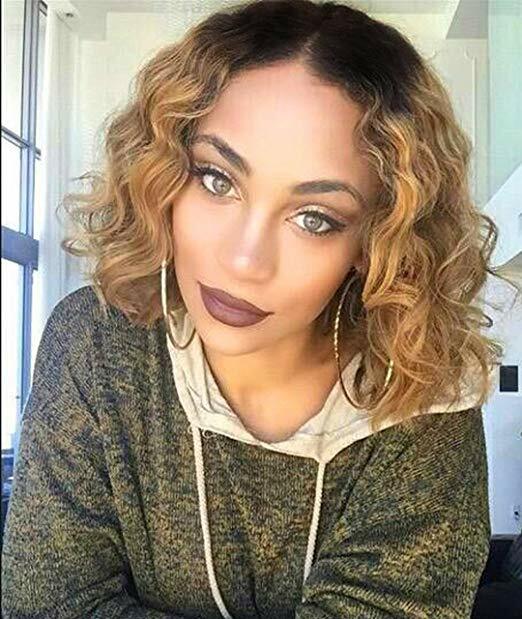 T1B/27 blonde ombre hair color and with black roots. 130% density while only middle part is with baby hair. Medium cap size (22 inch – 22.5 inch) & medium brown lace color. 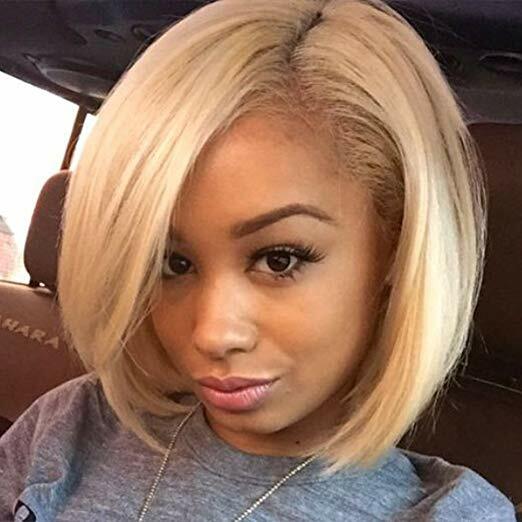 It’s Lace Front so its price is lower than other full lace ombre short bob human hair wigs. 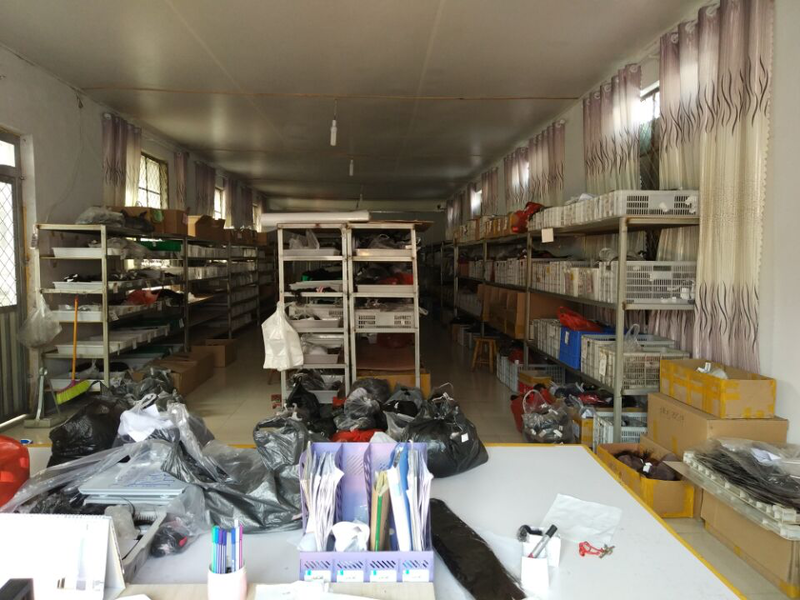 ZigZag Hair is a professional factory which produces high quality human hair wigs. Very stylish layered bob hairstyle with blonde #613 Color, 130% density, medium brown lace color & medium sized cap. Easy to wear: Glueless lace wig with Adjustable Strap and Combs. This #613 bob lace front human hair wig is made from 100% Brazilian remy human hair. 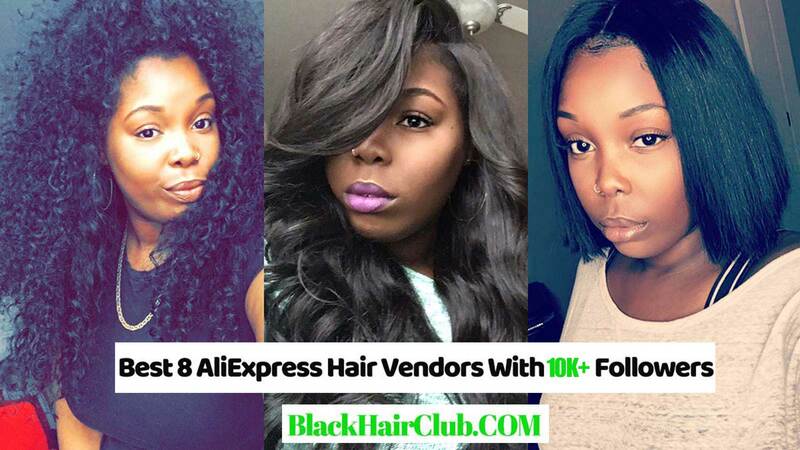 It looks best natural and can give you a perfectly authentic hair look every time. Every strand of hair in this hair wig is unprocessed and completely natural. It means the hair is smooth and shiny, and has a completely natural dark color. Pre plucked Hairline & 130% Density. 4 Lengths are available, 8 Inch, 10 Inch, 12 Inch & 14 Inch. 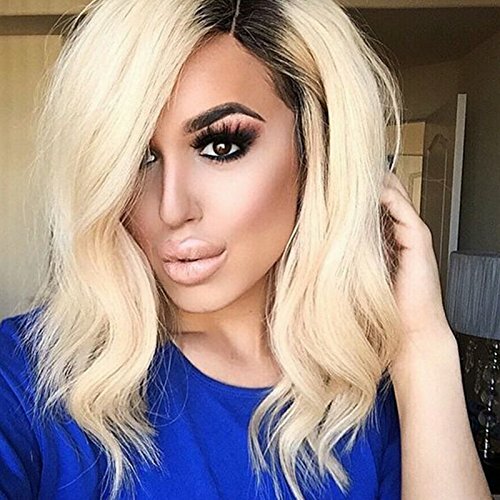 This blonde wig’s hairstyle is apparently inspired by Kim Kardashian. 100% Brazilian Virgin Human Hair, Full Lace, Two Tone Hair Color. The main hair color is natural so you can dye it at any time. Cap is average sized but you can ask for a large or small one within the 12 hours you make the payment. Lengths is available from 12 Inch to 16 Inch. Lace base is medium brown. Already buyers have showed their photos of wearing this wig, all amazing! You may say it’s a repeat one but I have to list it here. 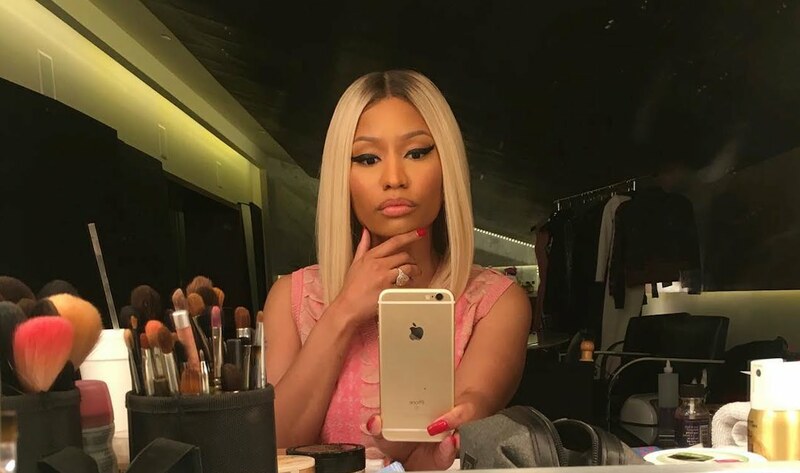 Very apparently its designer styled it according to Nicki Minaj’s iconic blonde hairstyle. 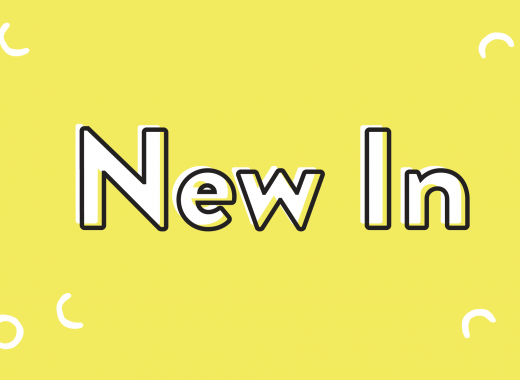 The wig is medium size cap, medium brown lace color and 130% density DEFAULT. If you have special requests on cap size and hair density, you can submit your requirements before placing the order. 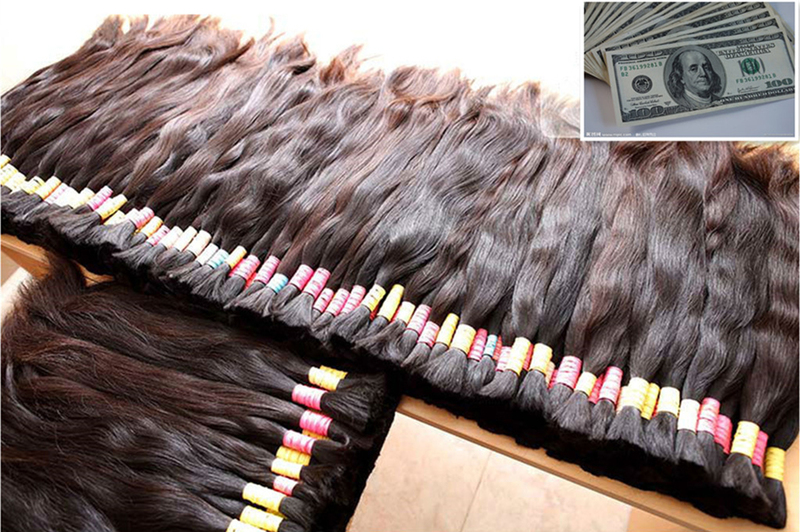 100% unprocessed Brazilian virgin human hair, natural, heathy, soft and smooth. Pre-plucked hairline, with baby hair around Perimeter, can be dyed, bleached and restyled. 130% density, unprocessed virgin Brazilian human hair, T4/613 ombre color, medium size cap and transparent lace color. You can ask for a SMALL or LARGE size cap if you need. Soak the hair gently with mild conditioning shampoo in cold or warm water. Rinse the hair in warm water towards to the same direction. 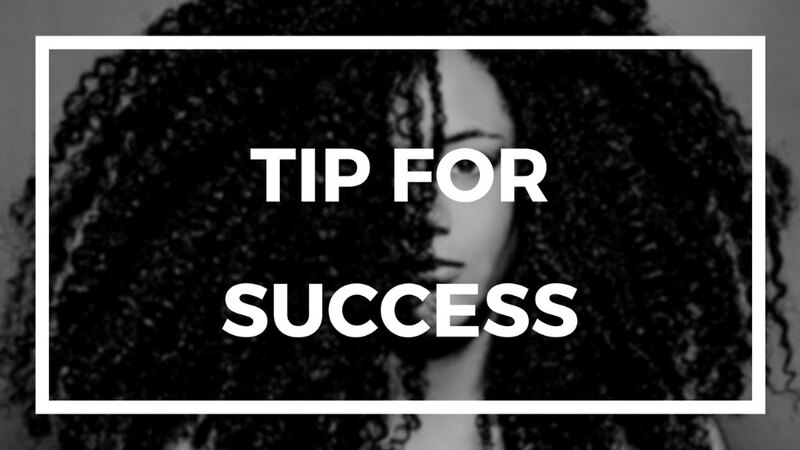 Brush the hair gently in a downward from top to end. Lay flat the hair and leave it natural air dry. Use the proper shampoo and conditioner—a very mild, not-stripping shampoo, and both products should be sulfate-free and have a low pH. Do not to blow dry the hair with a high setting since otherwise the knots may be damaged or split, just let it air-dry or in low temperature. Do not sleeping with the wig wear on. Do not wash the wig frequent, wash your wig about every three weeks or 2 weeks in the summer.